Saturn's distinctive rings were observed in unprecedented detail by NASA's Cassini spacecraft, and scientists have now used those observations to probe the interior of the giant planet and obtain the first precise determination of its rotation rate. The length of a day on Saturn, according to their calculations, is 10 hours 33 minutes and 38 seconds. This Cassini image shows in unprecedented detail a density wave in Saturn’s B ring, most likely caused by a small moon systematically perturbing the orbits of ring particles. The researchers studied wave patterns created within Saturn's rings by the planet's internal vibrations. In effect, the rings act as an extremely sensitive seismograph by responding to vibrations within the planet itself. Similar to Earth's vibrations from an earthquake, Saturn responds to perturbations by vibrating at frequencies determined by its internal structure. Heat-driven convection in the interior is the most likely source of the vibrations. These internal oscillations cause the density at any particular place within the planet to fluctuate, which makes the gravitational field outside the planet oscillate at the same frequencies. "Particles in the rings feel this oscillation in the gravitational field. At places where this oscillation resonates with ring orbits, energy builds up and gets carried away as a wave," explained Christopher Mankovich, a graduate student in astronomy and astrophysics at UC Santa Cruz. Mankovich is lead author of a paper, published January 17 in the Astrophysical Journal, comparing the wave patterns in the rings with models of Saturn's interior structure. 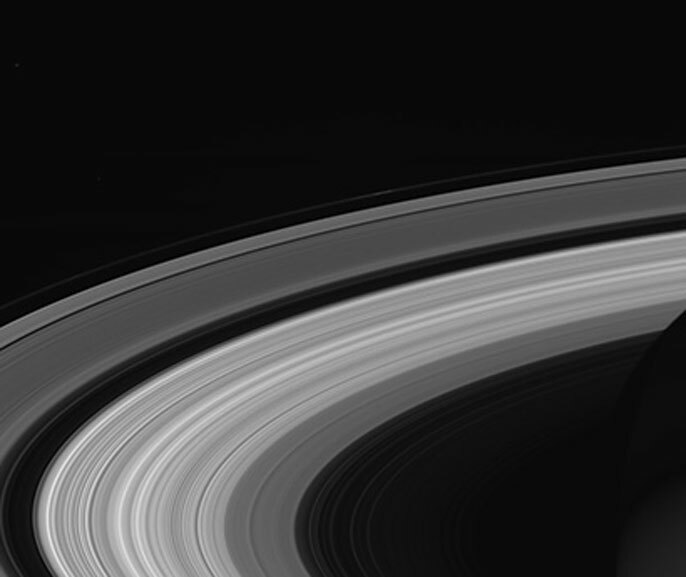 Saturn's C ring is home to a surprisingly rich array of structures and textures. Much of the structure seen in the outer portions of Saturn’s rings is the result of gravitational perturbations on ring particles by moons of Saturn, but some of the features in the rings are due to the vibrations of the planet itself. Most of the waves observed in Saturn's rings are due to the gravitational effects of the moons orbiting outside the rings, said coauthor Jonathan Fortney, professor of astronomy and astrophysics at UC Santa Cruz. "But some of the features in the rings are due to the oscillations of the planet itself, and we can use those to understand the planet's internal oscillations and internal structure," he said. Mankovich developed a set of models of the internal structure of Saturn, used them to predict the frequency spectrum of Saturn's internal vibrations, and compared those predictions with the waves observed by Cassini in Saturn's C ring. One of the main results of his analysis is the new calculation of Saturn's rotation rate, which has been surprisingly difficult to measure. As a gas giant planet, Saturn has no solid surface with landmarks that could be tracked as it rotates. Saturn is also unusual in having its magnetic axis nearly perfectly aligned with its rotational axis. Jupiter's magnetic axis, like Earth's, is not aligned with its rotational axis, which means the magnetic pole swings around as the planet rotates, enabling astronomers to measure a periodic signal in radio waves and calculate the rotation rate. The rotation rate of 10:33:38 determined by Mankovich's analysis is several minutes faster than previous estimates based on radiometry from the Voyager and Cassini spacecraft. "We now have the length of Saturn's day, when we thought we wouldn't be able to find it," said Cassini Project Scientist Linda Spilker. "They used the rings to peer into Saturn's interior, and out popped this long-sought, fundamental quality of the planet. And it's a really solid result. The rings held the answer." The idea that Saturn's rings could be used to study the seismology of the planet was first suggested in 1982, long before the necessary observations were possible. Coauthor Mark Marley, now at NASA's Ames Research Center in Silicon Valley, subsequently fleshed out the idea for his Ph.D. thesis in 1990, showed how the calculations could be done, and predicted where features in Saturn's rings would be. He also noted that the Cassini mission, then in the planning stages, would be able to make the observations needed to test the idea. "Two decades later, people looked at the Cassini data and found ring features at the locations of Mark's predictions," Fortney said. In addition to Mankovich, Marley, and Fortney, UC Santa Cruz postdoctoral researcher Naor Movshovitz also contributed to the paper. This research was supported by NASA and the University of California.